Now the company just has to make more than one. Starting a new car company is tough. In fact, it's nearly impossible. Then Tesla pulled it off. As we transition from the internal combustion engine to electrification, startups and even a few established players are taking a chance on EVs. Building a three-wheeled autocycle isn't revolutionary, exactly. But making an EV starting at $10,000, with all the usual amenities, makes it a car worth watching. Plus, it looks spectacular. I got a chance to drive the $1 million prototype of this Italian-designed car in Malibu last week. The one-off vehicle isn't street legal or ready for actual roads. It didn't have working seat belts and couldn't reach the speeds the company says the final production model will be capable of. But once I put it in gear and depressed the accelerator, it seemed like, with some fine tuning (not to mention passenger restraints), the car would be at home cruising through a residential neighborhood. Behind the wheel, steering and braking worked as advertised, even if the car was poky off the line and I wasn't able to do anything resembling freeway speeds. I got it up to a whopping 28 miles per hour in a beach parking lot, where I yanked the wheel left and right to test stability. Three-wheeled cars have had a bad rap since the Reliant Robin episode of Top Gear where they rolled a three-wheeled car every time it took a turn. Before you get concerned about the safety of future drivers, though, it's important to remember that the Robin in question was actually set up to roll over when it turned. So, yeah, the Sondors is stable even if it's still in the prototype stage. When the car does go into production -- which the company expects to happen in April 2019 -- the base model will have a range of 75 miles. Add an additional $3,000 for a range of 150 or $6,000 for a 200-mile reach. The zero-to-60 time will range from eight seconds to about five, which is pretty quick for a car that costs less than most used vehicles. Those speeds are thanks to a rear-mounted motor that will push out 170 horsepower and a whopping 323 pounds of torque to the front wheels. Sadly, none of that power was evident during my drive. What Sondors did deliver in its prototype was the design of the car, which is exquisite. If the company is able to get its car into production next year, expect a lot of people to buy the vehicle based purely on its looks. Photos of the car don't quite do it justice. During the four hours I spent with the vehicle, multiple people stopped to remark on how beautiful it was and wondered if it was on sale. Of course, gawking at a three-wheeled car at the beach is far different from actually buying a niche vehicle. Sondors CEO Storm Sondors seems fine with that. 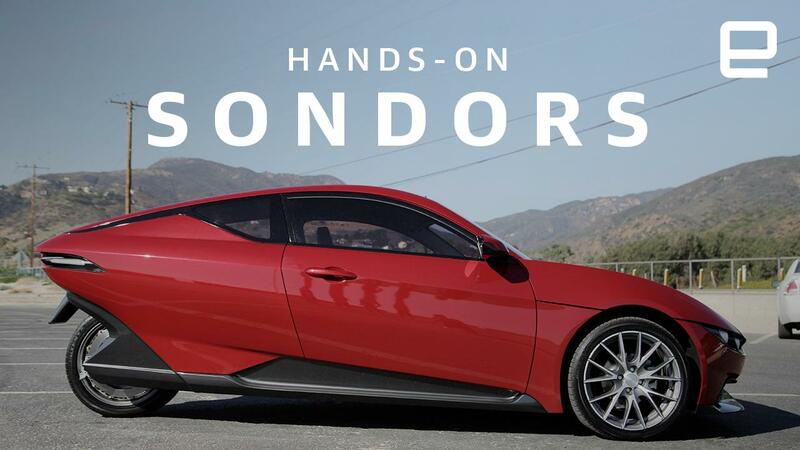 He says the car comes in response to the needs of Sondors' bike customers. He adds that the company wants to start slow, producing cars for the needs of its current customers and first adopters. He understands that scale is tough, especially when building a car. Indeed, even building 1,000 cars is challenging. The company does have experience producing electric bicycles, but cars are a different beast. Plus, there's that $10,000 asking price -- that's cheaper than most used cars these days. It's safe to say that delivering something that inexpensive is going to be a monumental feat. But I hope Sondors can pull it off. The world needs more affordable cars that catch the eye as well as reduce emissions. I just hope the production model is faster than the prototype.